Without these our maintenance regime would be considerably more difficult. But what exactly do we mean by tools? Tweesers, scissors, glass cleaners, gravel cleaners – these are some of the tools you should always keep in your cabinet. Below is a selection of tools that most hobbyists should use. When planting an aquarium, traditionally hobbyists used their fingers which although was functional was somewhat cumbersome. Today we use tweesers (curved or straight tipped) – the major benefit of this is the ease in which plants can be picked up and delicately placed into your substrate. Not only that but tweesers are also useful for picking up plants or removing debris from your tank. Scissors are also available in curved or straight tip. Curved tends to be more popular and is very useful when trimming foreground plants – the curved section allows you to cut a better angle. Nevertheless a good pair of sharp scissors are excellent for keeping your plants in good shape. 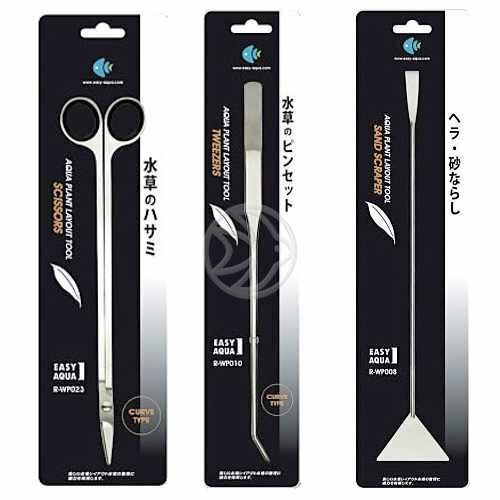 The scissors available are normally 12” long so you can reach a good distance and are very useful if you need to trim the base of any plant that is hard to reach. Spatulas/Rakes are used primarily for smoothing gravels and substrates. Often when plants are moved about or indeed planted for the first time, substrates can become disturbed. A spatula or rake is a flat shaped and is unique in its design and purpose. Magnetic glass cleaners are a wonderful tool that are used for cleaning algae off the inside panes of your aquarium. Algae can build up quite quickly on glass so using magnetic cleaners once a week keeps things clean. This tool is separated into two sections – a rough side on one and a smooth on the other. The rough side sits on the inside pane and the smooth on the outside. A top tip when cleaning is to make sure no gravel gets stuck on the inside as it is easy to scratch the glass. The added benefit is that the inside piece floats so it if you dislodge it when cleaning, rather than it sinking to the bottom and you having to hook it out, it floats to the surface. The last piece of equipment which is extremely important to a planted aquarium is a a gravel cleaner. Although strictly it’s not used for what it was initially designed for (at least not in a planted aquarium). Rather than plunging the cleaner into the substrate it’s a better idea to hover slightly above it, only suctioning debris such as dead plant matter and fish excrement. Of course while this is being performed you are removing tank water as well. It’s really important to replace water regularly (minimum of 30% per week in a non CO2 tank), as not only is this better for the fish, but it helps to reduce any excesses that may have built up. In tanks which use CO2 these water changes need to be increased and 40-50% once or twice a week. By not performing these types of water changes you invariably end up with issues. Lastly if you’re looking for a useful tool set, that has scissors, tweesers and a rake then I highly recommend the Aqua Essentials 3 piece tool set. It comes packaged in a neat leather case with a zip to keep your tools in one place and costs only £29.99.